I've been cautiously dipping into China Mieville again. I'm always impressed at his books, but feel like I need to pace them: he's so good at building atmospheres of dread that I feel like I need to air out my mind for a while after finishing one of his stories. I was a little surprised, but pleased, so discover that The City & the City isn't as taxing as the New Crobuzon novels. It isn't exactly happy, but it feels a bit more sleek and a lot more modern. As I read it, my dominant thought was generally "Oooh, I wonder what'll happen next?" as opposed to "Oh no, what's going to happen next?" The New Crobuzon books are set in another world, a kind of nightmare Discworld, but The City & the City is set in our world, probably around the present day. The characters use the Internet, quote Hollywood movies, seek to attract American investment dollars, and otherwise participate in the global world. The interesting difference is that the city itself, Besźel, doesn't exist in the real world. Based on the descriptions peppered through the novel, it seems to be a Balkan city-state, located on a coast (though it's unclear which one). Like a lot of the real-life nations in that area, it is relatively stable but economically disadvantaged, proud of its traditions, and trying to make its way in the world. ... I'm not sure whether to quality this as a "mega" spoiler because it's revealed very early in the book, but the reveal is so delicious that I'd hate to spoil it for anyone. The most distinctive feature of Besźel is something that the narrator and every other character takes for granted, and so we don't realize it for some time, even though it's surrounding everything in the story. Besźel has a counterpart city, named Ul Qoma, which occupies the same physical space but is completely separated. My mind was somewhat primed for this idea because I've been simultaneously reading through Charles Stross's Merchant Princes series, which posits a series of alternate Earths that occupy the same space but diverging realities. 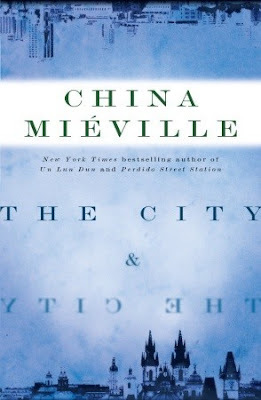 I thought it was interesting and cool that Mieville was working with a similar concept, but to a very different effect, with a weightier noir detective story instead of an adventurous thriller. I started trying to unpack how the system here worked: unlike the Merchant Princes, Besźel is integrated into the real world, so does that mean that Ul Quoma is in an alternate dimension? How is its America different from Besźel's America? Can everyone cross over everywhere, or is there something unique about Besźel? And, given the huge economic implications to parallel worlds explored in the Merchant Princes, I started wondering how it would affect the world in this story. It seemed odd that it would end up so close to our own world with such a major difference. As Inspector Tyador's investigation forces him to more closely consider Ul Quoma, I started entertaining a fanciful notion. "Heh... wouldn't it be funny if there WASN'T an alternate world? What if both Besźel and Ul Qoma are in our same world, and everyone just, like, pretends that they can't see each other? That would be amazing!" I held that idea in my mind for a good, I dunno, hundred pages or so until it slowly, gradually dawned on me that, yup, this is EXACTLY what the situation is. As far as everyone else on the planet is concerned, Besźel and Ul Qoma are one city with two odd and highly distinct cultures. For its citizens, though, these cities are (and must be!) entirely separate. A very strong and multifaceted defense keeps the two apart. It consists of cultural taboos, social training, and the power of the state. We eventually learn how parents instruct their children from a very young age to "unsee" objects and people that belong to the rival city. Growing up in this culture, everyone gains an instinctive ability to recognize whether something belongs to one city or the other. A building's architecture, a person's clothing style or walking gait, species of plants: all of these are markers of being in one city or the other. Some areas are Besźel or Ul Qoma "in totality": an entire street might belong entirely to one city or the other. But many areas are "crosshatched", with Besź and Ul Qoman people operating side by side but forbidden to interact with each other. As a reader, you sort of need to reverse-engineer the snippets you receive from Tyador to reconstruct what's actually happening. As an example: on a busy throughfare, both Besz and Ul Qoman cars might be sharing lanes. The Ul Qoman cars are sleeker and more modern, while the Besz cars are older and blockier, so everyone knows at a glance which city each belongs to. If you're Besz and another Besz car cuts you off, you might curse at the driver and flip him off. But if it's Ul Qoman, you must studiously ignore it; more importantly, the Ul Quoman driver would have given you a large berth to begin with so neither of you must interact with each other. And what if there's an emergency? Each city has its own police, each with its own type of siren. If an Ul Qoman siren starts to sound, all Ul Qoman cars immediately make way. The Besz cars shouldn't acknowledge the Ul Qoman car, but instead they will, seemingly entirely by coincidence and random chance, happen to open up a lane, while pretending that nothing happened. Beyond the police, though, the ultimate authority overseeing this system is Breach, a shadowy yet omnipresent force that monitors all people in both cities looking for any sign of infraction, of seeing what should not be seen, and acting swiftly and mercilessly to resolve any breaches between the two. Breach is powerful, but has a limited porfolio: they don't care about crime or justice or policy in general, they only uphold the singular duty of keeping Besźel and Ul Qoma separated. Coming to the end of the novel, I started to wonder if it was intended as a metaphor or exploration of the kind of selective vision we city-dwellers acquire. Like the citizens of Besźel, we are trained from an early age to unsee: don't stare at that man on the sidewalk, don't engage with the person asking for money, don't look at what those people are doing in the alley. We build and maintain this fiction that those things aren't happening in our city. Of course, everyone around us knows that that thing is there, but they're all similarly ignoring it, and so we sort of construct this alternate agreed-upon reality that we implicitly choose to occupy. And, it's the same from the other direction as well. Here in San Francisco, homeless people will greet one another and hold animated conversations, while ignoring the young professionals walking past them on the sidewalk. Different groups of people, grosstopically occupying the same physical space, but having an incredibly different experience of San Francisco and building up a culture of people who conform to their same viewpoint. This isn't a radical idea, of course. Among other things, I was reminded of Infinite City, a great atlas from Rebecca Solnit depicting SF through a variety of lenses. I've spent much of the past decade in the Mission District and feel like I know it well; but the Mission District I know is a place of parks and trendy eateries and "dive" bars and music venues. There's another Mission District which is a sort of DMZ, an armistice between the Nortenos and Sureños: one of the maps in Infinite City shows the territory claimed by each at the time of its creation. I walk across those lines every day and never even think about it: it doesn't exist for me, and I don't exist for them. But if I had brown skin, then I would need to be aware of those lines and the colors I wore and all of the customs and consequences of that other city which occupies the same space. Anyways! It's an interesting thought experiment. I have no idea if that was at all part of Mieville's intention in writing this. It seems like it might be... I dunno, too obvious or too pedestrian. He might have just been inventing for the fun of it, or had some deeper perspective that I haven't caught onto. Regardless, it's a really stirring idea. Heh... after all that discussion, I haven't talked at all about the actual plot or characters! They're good. I like how the people, especially the narrator protagonist, are fully rooted in their world and roles. The plot is cool, maybe moving a little too swiftly at the end but still thrilling and clever. For me, though, it's the worldbuilding that's most impressive, and that's the part that will linger with me. This is a beautiful time of year. We're close to the summer solstice, so days are long, with bountiful sunshine filling the hours. And so, of course, I'm spending those long summer days hunched over a laptop, prying into forbidden secrets and raising an army of minions to subvert the natural order and plunge the world into its doom. 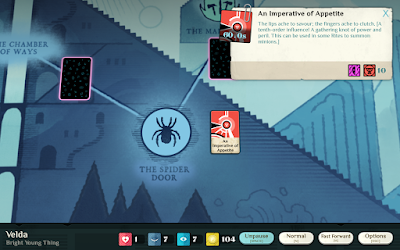 The game is Cultist Simulator. It was created by Alexis Kennedy, a founder of Failbetter Games and the creative force behind Fallen London (my longest running online gaming experience) and Sunless Sea (a wonderfully atmospheric and odd roguelike which I embraced). 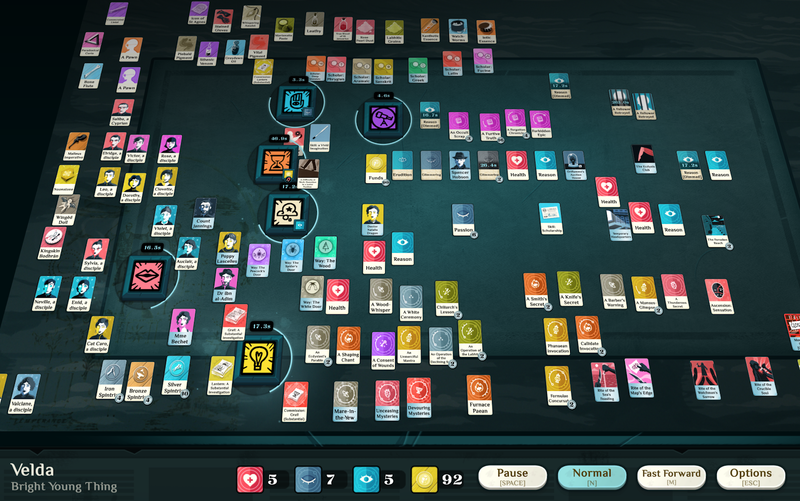 That's quite a pedigree, but I was a bit skeptical of Cultist Simulator when it was first announced. I don't really like playing as "bad people" in games, and while I was confident it would be well-designed, the subject matter didn't seem like it would speak to me. I passed on the Kickstarter and have mostly ignored its development, including a long and very transparent Early Access phase. The response to the game has been positive, though, including in the Failbetter communities in which I participate, and so I took advantage of a launch-week promotion and picked it up. It proved to be shockingly addictive, and I've found the gameplay and lore occupying much of my waking life, even when I'm not actually playing. The addictiveness is real. 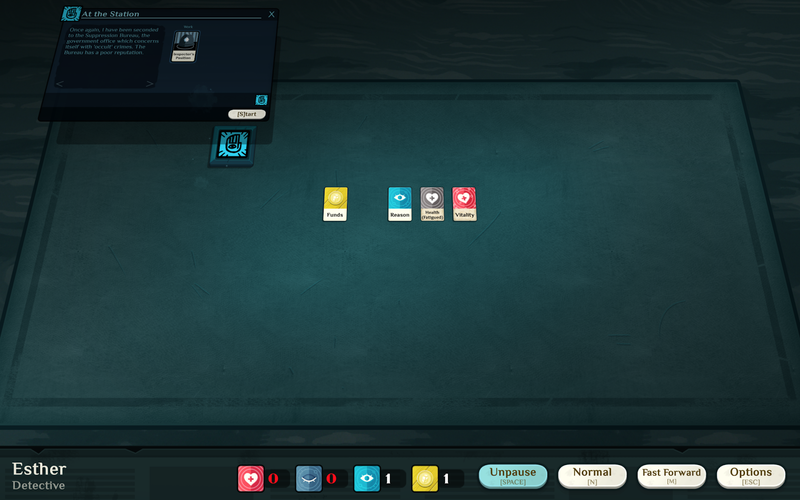 The overall experience of playing Cultist Simulator feels uncannily like playing a good game of Civilization: "just one more turn" has become "just one more minute", and it gets really hard to pull yourself away from it. In Civ, you might be about to log off for the night, and then realize that you're just two turns away from completing a Wonder that you've been working on for a while. So you stick around to finish that as a good stopping point. Except then France declares war on you the next turn. So now you need to marshal your army and order everyone to the front. And before you know it, your evening has vanished, as schemes and plans whirl and evolve in your head. The text is really tiny and hard to read. 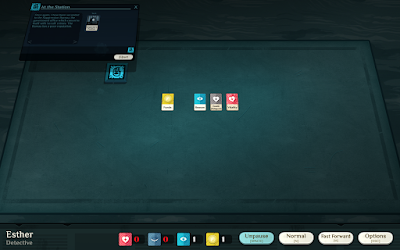 Between this game and Sunless Sea, I'm kind of astonished that people put such effort into creating rich, word-dense narrative games, and seem to pay so little attention to making those words physically easy to read. And I'm lucky enough to have decent corrected vision; I'd hate to be someone with legitimately poor eyesight. The mechanics feel needlessly obtuse. This is clearly by design and so I can excuse it, but that doesn't keep it from being extremely frustrating for the first hour or so of play. 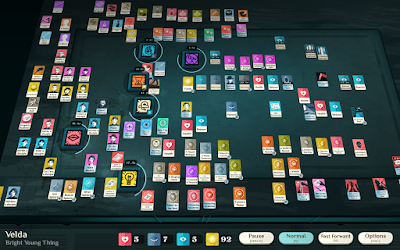 I do think it's much more in keeping with the theme than Sunless Sea; that game also had a steep learning curve, but since Cultist Simulator is all about flailing around and experimenting and unearthing secrets, the opaque gameplay definitely matches the narrative. And, I think that's it for negatives! Do keep your expectations in check: the game is about 100MB large, with minimal art and no video or animation or 3D models. It's very much one of those games that plays out inside your head as opposed to in front of your eyes. 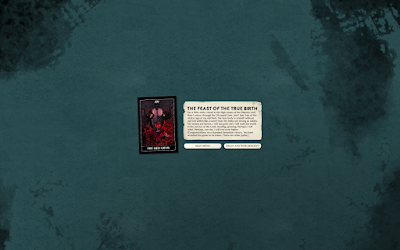 When I first read about this game, it sounded like it was influenced by Aleister Crowley, or maybe HP Lovecraft. Once I got into it, though, it reminded me a lot more of From Hell, Alan Moore's seminal graphic novel about William Gull. I got this most strongly in my interactions with the Mansus. I had stumbled into it in my first game, not knowing what I was doing, and couldn't remember how I had made it happen or how to go back. I went through a second game never reaching it, desperately trying one act after the other, muttering to myself "I must go back to that place! I have to know!" There is this desire for knowledge, for revelation, that pushes you forward, and can prompt you to do things you ordinarily would not consider. I eventually won a victory with a Grail cult pursuing the Sensation goal. It's kind of squicky... I had intended to try for Heart or Knock or something, but got impatient while waiting for other lores to turn up in the very early game, and reasoned that I was probably going to lose soon anyways. As with Sunless Sea, though, the lessons you learn in your early failures significantly improve your survivability later. There were some VERY close calls, though. There were three or so times where I would definitely have lost by going insane or succumbing to despair if I hadn't lucked out with a visit to the Mansus at the last second. (Sometimes literally: less than one second remaining before failure.) As I got further along, I grew more paranoid, and would more aggressively treat my Fascination or Dread as they appeared. Dreaming on these is a good strategy, but I also really like using them as Trappings for cult business or otherwise tossing them into slots where they can be consumed. Lo-fi games like this are so fascinating because you get caught up in the mechanics of play, and then are abruptly reminded of what concepts and flavor those mechanics map back to. I started laughing as I was approaching the endgame as I realized just what I was doing: after a long period of being cautious, avoiding detection, minimizing potential harm, I was now shoving one prisoner after another into the Spider's Gate, hoping that their blood would reveal the Grail Influence I craved. Then, once I grew impatient at how long it was taking me to find hirelings to imprison, I started locking low-level pawns into my closet. "These anonymous fools will serve me in death as they never could in life! ", I might have said. And... it worked! The steady stream of prisoners kept my appetite fed and kept the Mansus open. I'd been distracting Ezeem in my parlor, nattering at him about inanities, and then sat bolt upright as an Imperative of Appetite came to me. We raced to the basement, recited the Devouring Mysteries, and boom: game over! In keeping with the Civ parallel, the ending might feel a little deflating after such a long and challenging game, but I didn't begrudge it at all. The entire game has been text, so it's very appropriate to get more text here, and I definitely won't demand a rousing animatic from a tiny developer. Focus earlier on higher-level Expeditions. I'd assumed that the more obscure ones were more difficult, but as far as I can see, they are not. Start doing Expeditions as soon as I can field Disciples. The Tools you get from here are incredibly helpful and accelerate all sorts of things. Start summoning earlier. I'd been scared off by the warning of creatures escaping. They only can escape while being summoned, and the damage they cause is minor. Especially when using the Rite of the Map's Edge, they're more or less free and can help with all sorts of stuff. Sell off most Spintria. I'd been stockpiling it throughout the game in the expectation that it would be needed in the endgame, but it's almost useless; I think I used it twice. It sells for a lot, and I now think that focusing on commissions is probably the best way to make money, if you can handle the Mystique. Anyways, I ended up with over 100 Funds just from cashing in most Spintria, and it's very nice to not live hand-to-mouth. Aggressively recruit people with Talk. Again, I'd been worried about attracting attention, but it's totally fine, especially if you don't have Notoriety. In an earlier game, I'd done almost all my recruiting via Peculiar Rumours, but that's much worse, as you always get Notoriety. Be more careful about subverting low-level lore and/or stockpiling Tier 6 Lore. 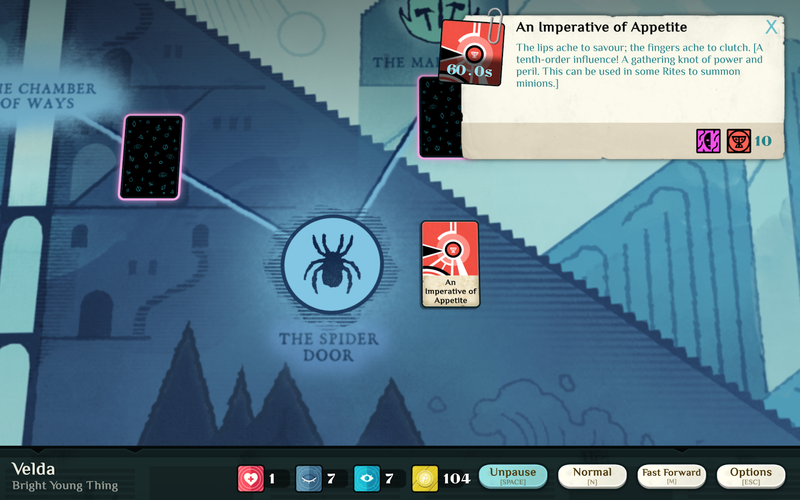 I spent days stuck outside the Stag Door because I had subverted my Moth lore and couldn't answer the riddle, finally getting it only after I had retrieved a much higher-level Lore and breaking it down. I think I might try for a Moth cult next time, as the ability to destroy evidence seems very useful. Heart would be thematically nice as well, though maybe not especially useful if I'm drowning in Mystique. I'm starting to think that it could be good to alternate between periods of high Mystique (recruiting members, fulfilling Commissions) and periods of low Notoriety (just Expeditions). Expeditions take long enough that most of your Mystique might burn off by the time one is done, and you should be able to time your Heart member to start dragging in Notoriety at the time you complete the mission. I'm unsure about the best background. My victory came with the Bright Young Thing, who I had initially viewed as a throwaway run: you can't access any of the special jobs, and your initial inheritance is only a temporary boost. But, the BYT does get access to more Health, and I now think that might be a solid choice: you can earn a lot more Reason and Passion by studying books, and even though I started out without much of either I ended up with more of that than I could use. Health is a lot harder to come by. That said, the Doctor was one of my favorite runs, as you never need to worry about taking a break from Institute work to pursue your other goals. My one run as a Detective was also intriguing. You can earn a LOT from the top-level Investigating job, and will get plenty of Reason to always get the best income. It also has a much longer cooldown than clerical work, giving you more flexibility to alternate it with other tasks. But the mechanics of this would probably get annoying in the endgame, as you would end up with tons of useless Evidence. (This is an area that honestly feels a little buggy, and I wouldn't be surprised if the late stage of the Investigating job is patched in an update.) All that being said: like I said above, in the future I might just neglect the mundane job and instead focus on commissions. Anyways! I'm definitely taking a break for now. Addictive games like this can be a lot of fun, but I also need to treat them with caution. It sounds like there are at least some expansions planned, and it'll be interesting to see where it goes next. There are already some elements like the headquarters and spintria that seem ripe for new functionality, and I'm sure there are more which I haven't even imagined yet.